Lotus Heart Hospital is one of the pioneer heart hospitals of its kind in South Kerala. It was the vision of Dr. Johnson George a renowned cardiologist, with a vast experience in the field of cardiology, which took shape on 6th May, 2009. The impetus behind the establishment of this hospital was his dream and dedication to extend exceptional cardiac health care to one and all. The hospital was formally inaugurated by Former PWD Minister Dr. M.K. Muneer, Former Member of Parliament Dr. K.S. Manoj and Dr.Venu IAS who were all former classmates of the Managing Director, Dr. Johnson George. Lotus Heart Hospital is a dedicated heart speciality hospital with state of the art facilities and a fully equipped Coronary Care Unit. 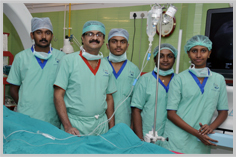 We at Lotus Heart Hospital have a competent team which provides specialised cardiac care which is affordable. Lotus Heart Hospital aims not only at providing emergency treatment to victims of heart attack and related heart emergencies, but also early detection and prevention of heart diseases. Our cardiology services are sophisticated and uphold international standards. Our hospital is an organization established to document, implement and to maintain a quality management system in continually improving its effectiveness in accordance with the requirements of ISO9001:2008 standards. Ours is an ISO certified hospital. Lotus Heart Hospital is a dedicated heart speciality hospital with ultra modern and fully equipped Coronary Care Unit aiming not only at providing emergency treatment to victims of heart attack and related heart emergencies but also diagnosis, early detection and prevention of heart failures. Our cardiology services maintain international standards. Our aim is to provide the best of Quality Modern Cardiac treatment – approachable, acceptable, affordable and amicable.